Knowing the speed limits is extremely important, but sometimes it gets difficult to keep track of the current speed limit. Luckily, Sygic GPS Navigation includes Speedometer and Speed limits, so you will always see your current speed and the maximum allowed speed on the road you are driving on. You should always look out for road signs to know the exact speed limit on that specific road. But sometimes you miss a sign. This happens especially when you drive on unfamiliar roads or you look out for other cars. And sometimes you get distracted by your passengers. Drive with Sygic GPS Navigation and you will always know the current speed limit, even when you miss a sign. You will get clear visual and voice alerts every time you exceed the speed limit. For increased safety and a smooth driving experience, Sygic will also warn you about the upcoming speed limit change before it becomes effective, so you can adjust your driving accordingly. This feature also helps you to stay safe when making a turn. If you approach a sharp curve at a high speed, the app will warn you and even recommend a safer speed. You will drive safely and avoid paying unnecessary speeding tickets, too. 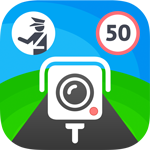 Sygic will alert you when you approach a speed camera, so you will always have all the information you need to prevent getting into trouble for driving too fast. The Speed limits feature is part of the Premium packages, you can get it by purchasing one of our Lifetime licenses.